In this changing computing landscape, Google’s Chromebook has kind of been lost amongst the rise of the tablets and bigger cell phones. Early versions of the Chrome operating system seemed clunky and pricier than one would expect, which I think is why the Chromebook has been kind of a dud so far. However I was talking to a co-worker the other day who purchased a Chromebook for his nephew for Christmas, and he was impressed with the operating system and the price. Looks like the floor price for new Chromebooks have hit $199, and the operating system is improving, and getting more positive reviews. For people who dont want to spend money on computers and just want to browse the internet and compose email – the Chromebook seems like it might be right choice. How many people these days really need a full blown Windows PC? I would guess 80% of people buying laptops only need it for email and web browsing, and if thats the case Chromebook probably is a nice cheap appliance for that. Interestingly, you can also get Windows PC’s for close to that price – the cheapest Windows 8 PC I found was $299. Buy that is still $100 more than the Chromebook, and if you don’t need the overhead and functionality of a full computer, you are not getting alot for that (and at that price point, you really cant play power hungry PC games or Photoshop). So the year 2013 might bring a new player into the PC and tablet wars – further driving down the prices of these internet appliances. I was reviewing my stock market portfolio the other day, trying to make sure I understand why I have some of the stocks in my portfolio. Intuitive Surgical (ISRG) caught my eye – its a stock I bought a while ago (I actually don’t recall why now), and it had now grown into a top holding. I noticed my valuation model at Puget Investor had recently flagged it as underperform, primarily due to valuation levels. The stock was selling at 530, so for half my position I put a limit order in at 531 or so, trying to get cute and pick up an extra buck. My order didn’t go off went off because it never hit 531, and dropped into the 520’s. So the next day the stock opened at 520, and because at this point I was frustrated and had a use for the money in other stocks, I put a sell order in at 521 and it sold. I still had the other half of my holdings, so I still was watching the stock. Of course in the next week the stock hit 540, and now I was really mad at myself for trading irrationally – why didn’t I wait? Then on Wednesday I saw the stock getting hammered, dropping down to 515, but I didn’t see any news and I didn’t have time to research it. This morning when I checked it it was at 505 – and because I still had half my orignal holding, I did a little research and found this article at fool.com. Essentially there are rumored to be an increasing number of lawsuits against surgeons who have botched things with the machine, and other negative news. I had to make a decision – is this just a stock manipulation (very possible), or is this smoke where there may be fire? I did something I rarely do – I when ahead and fired off a market order the current price ($504 – ouch!). Why? First of all I did a market order because I didn’t want to try to squeeze a dollar or two out of the stock when there was such potential risk. The other reason for selling was Puget Investor convinced me that the upside potential wasn’t that great, and I am staring a possible disaster in the face. 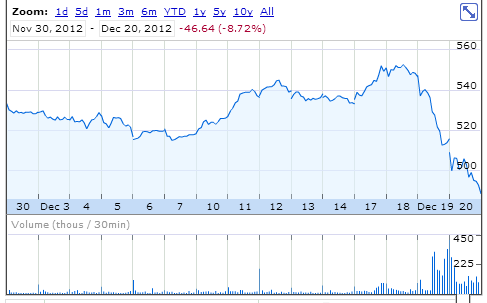 ISRG ended the day at 488 – who knows where it will go from here. I feel good that I was proactive in identifying that I really shouldn’t own this stock before all this started happening. I know nothing of the medical industry, and to own a stock of this valuation you really have to believe in it. Ideally I should of sold it all at $540, but when you dont believe in a stock anymore, its probably time to get out rather than trying out how to find the top. Even if this news isn’t true, there will likely be enough lingering rumors that the stock wont be outperforming the market anytime soon, so if I change my mind I could get back in. I also am questioning the wisdom of limit orders – maybe they fall in the pennywise pound foolish category. I am re-evaluating my use of limit orders, and if I want to make a move don’t try to game the market. Medium to long term ISRG could very well jump higher from here and I will be proven wrong (at which point maybe I will delete this post…), but I think I will be comfortable with my actions regardless of what the future holds. OK, I know I have been ranting about covert ops lately, but I have just one more. Naturally I was suspicious when reading about the doctor being rescued by the Seal Team. Since when does the US send the Seal Team in to rescue aid workers? No mention of any people who work there, a white paper dated 2007. All the job postings are from January 2012 (except for 1 from April 2012). Of course no address – just a PO Box. Sure looks like a front to me.. but then I am no expert. Check it out for yourself. A quick note here – regarding Irans claim that it downed a drone. It is sad to me that I believe Irans version of the story over the United States version. The previous lost drone was denied by the US until Iran came out with pictures. The CIA and the military has done nothing but lie to us regarding its involvment in Iraq, Libya and Syria, and thus has no credibility. Will President Obama please do something to reign in the CIA and the military industrial complex an reverse the distrust in the federal goverment? So this chart provided in an article by Bond Fund guru Bill Gross ) says anytime the deb to GDP ratio gets above 90%, growth slows, and inflation increases. 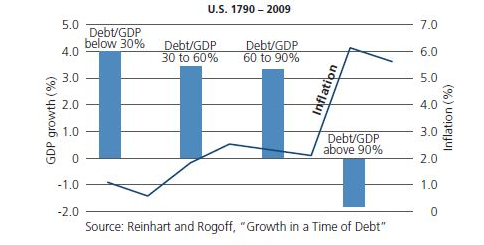 Debt to GDP in the us is now above 90%, so assuming this whole fiscal cliff situation gets resolved, and results in tax increases and or spending reductions which reduce the deficit, one would have to assume this austerity would have a negative effect on growth. I am still skeptical that inflation will increase – I go back to my Japan Economics post to believe that inflation wont reignite. Given the growth of consumer debt, especially student loan debt, how much longer can the consumer go before deleveraging must begin? 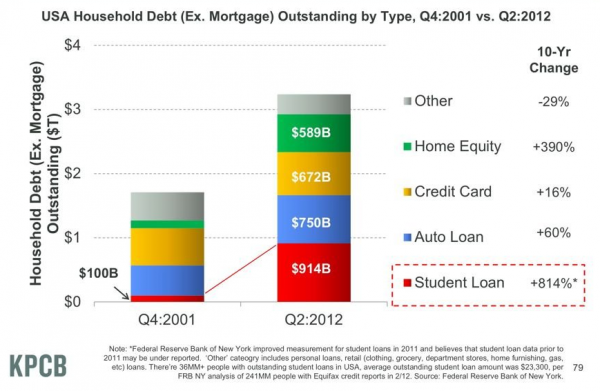 If we assume the consumer wont be growing debt much more in the next few years, one would have to assume the consumer wont take up the slack if and when government deleverages. So I am not looking for much earnings growth in 2013. I don’t think the stock market will have as good of year as 2012, however it wouldn’t surprise me if the market does better than bond yields. However this all changes if government continues to go into debt – at which point I would consider reducing exposure to bonds increasing exposure to inflation defensive assets such as gold, real estate and commodities. So keep an eye on what goes on in the next few months – it should be an interesting year.